It was an overcast and fog-filled March afternoon in San Francisco when I took part in the Mercedes-Benz F-Cell World Drive. The event is both a celebration of automotive history, coinciding with the 125th anniversary of the original automobile, and a proving ground for the potential future of automobiles: hydrogen fuel cells. 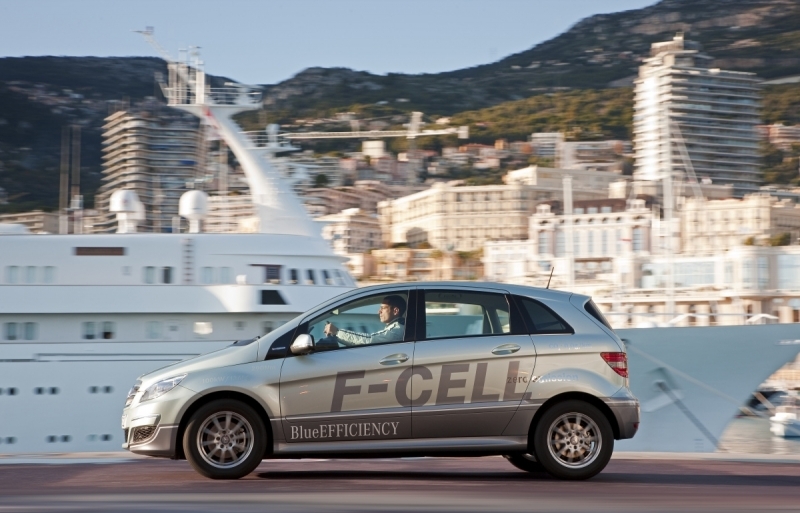 The Mercedes-Benz F-Cell is a hydrogen fuel cell and battery-powered hybrid built into a European B-Class body (imagine a truncated R-Class). The body, interior, suspension and handling are all as you would expect from a Mercedes-Benz: stoic, solid, safe and sound. The power supply is where we leave standard expectations behind and step toward, if not into, the future. I was ecstatic to be driving a hydrogen-powered car after keeping tabs on the development by various carmakers for seeming decades; so how did expectation compare with experience? The first immediate standouts when approaching and boarding the F-Cell are the features most unique to it: the hydrogen emblem under the hood, the power meter on the instrument cluster, the navigation unit displaying Flash Gordon-esque readouts that display your power source and input/output. So far so good. But then I discovered that driving the F-Cell was amazingly… normal. I wanted a space ship and instead got a whisper-quiet car with room for half a soccer team inside. How could this be? I got up to speed with a quickness I didn’t expect from a B-Class, but there was no triumphant announcement from the tail pipe as many of us have come to expect and often associate with performance. No, instead of a throaty rumble to declare my arrival I had water vapor purifying the path behind me. Yes, water is the only byproduct of this hydrogen-powered car. But what other trade-offs were there? Honestly, none this driver could find. Overall, it has healthy acceleration for its class, a roomy interior and provides great driving experience. So, while expecting Mercedes-Benz to deliver a space ship made safe for the road, I was happy to drive a mere reinvention of the automobile we all know and trust today. Add to that a likely commercialization by 2015 with a price tag around $50K (we imagine tax breaks will reduce that number), and you really have to start believing that this is what the future might look like. Right now, leasing is available to a limited number of customers in three countries: America, Germany and Norway.